1 – Application-consistent data protection. The application should be protected in a consistent state that the application can easily recover from. 2 – Object-level recovery. The user should be able to recover one specific object within the application (one specific SQL database, one Exchange mailbox, etc.). With our latest 3.0 product announcement, we’re providing very broad coverage for VMware and physical servers. See the table below for a summary of our supported platforms and apps (although we’re not stopping here … over time, we’ll want to protect Hyper-V, OpenStack, etc.). For Microsoft SQL Server, we take things a step further. With our 3.0 announcement we’re now providing the Cohesity SQL Adapter that enables ‘any point in time’ recovery. 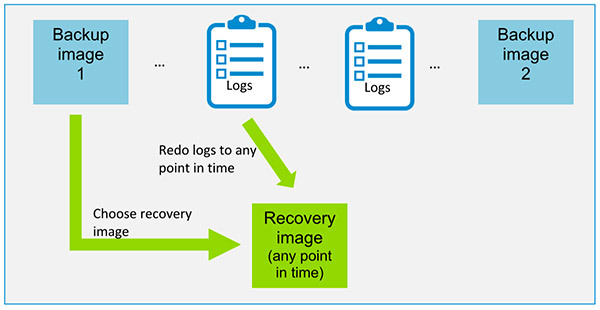 Think of this like time-machine for your SQL Server – you can recover your databases to any point in time included in your backup retention period. How do we do this? As with any Virtual Machine, we first take a backup of your entire SQL VM. But, in addition to the VM disks, we also backup the SQL Server log files. We can then replay those logs to any point in time between two VM backups to recreate the state of the database. 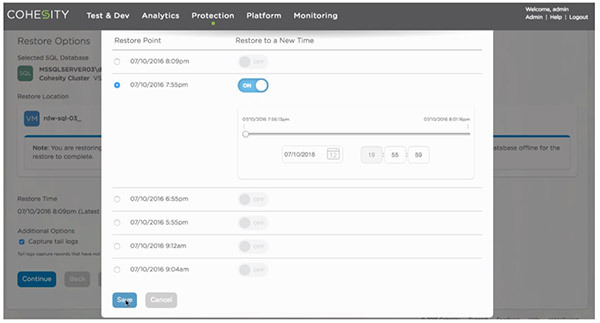 It’s very cool and allows you to recover back to the last point in time before you experienced data loss or corruption – really minimizing the RPO. From a UI standpoint, it’s pretty slick and looks like the picture below. Essentially, you first select which backup image you want to restore from. Then just use the slider to decide how far in time you want to replay the logs to, in order to get back to the precise point in time you want to recover to. That’s all there is to it … Cohesity will take care of the recovery. This is just one example of a great app integration now offered with Cohesity 3.0. 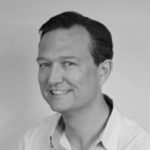 Over time, we’re focused on continuing to expand our integrations – both with the platforms (VMware, other hypervisors) and the apps. Stay tuned!